Guitar stompbox is one of the necessary attributes of a rock guitarist, in addition to the guitar. Most often, the word “lotion” people mean guitar effect like “distortion” or “Overdrive”. This effect gives the guitar a somewhat distorted and dirty sound, used in almost all types of rock music. Guitar distortion effect usually looks like a small pedal with the volume controls, which can be connected to any guitar and amp. To save money and to create their own inimitable sound, you can make a lotion for guitars themselves. Engage in theoretical training. Learn how to read electronic circuit, to use a prototyping Board and soldering. Locate and download scheme simple distortion pedals. Choose a template consisting of a small number of components with no integrated circuits, which you can start to use, when you gain experience. Create a list of required components. Usually such lists are attached to the schemes. If not, copy the ingredients directly from the scheme and add other necessary things, for example, the case of the pedal, audio adapter and wire. It's time to go to the store radio products. Itemize all the connections in the circuit. Give a number to each connection between two components. So you don't miss a single step. Insert the components into the prototyping Board. Each electronic component has two or three small protruding metal wiring with which you will be able to securely attach components to the Board. Connect the two components using wire. Bare wire ends and wrap them around the terminals of each component, and then solder the connection. When you spaete all connections, time to start assembling the pedal. Slide the mounting Board into the housing of the pedal and secure it with tape or screws. Take two guitar cables, one of them will connect the guitar with the lotion and the second lotion with a guitar amp. Turn on the pedal and amp. Time to play rock! Don't forget to insulate the exposed ends of the wires which can cause short circuit. How boring it would be guitar without effects pedals. Would have to enjoy only the kind of acoustic sound with adjustable volume control. It is largely thanks to these effects and born styles such as jazz, Blues, rock-n-roll in all its forms. Effect pedal or stompbox guitar floor switch, distorting or giving additional hints of guitar sound. Every pedal usually gives only one musical effect. Sometimes there are models on two similar effect. In contrast to the "home" of musicians, professionals just need a set of lotions for more powerful, deep and clean sound. All the necessary effects form a chain. For example, according to this scheme: guitar-wah-compressor-Overdrive modulation effects (delay, reverb, Flanger, etc.). The meaning of the effects of distortion and Overdrive in the distortion of the guitar sound, turning it into a growling sound, without which it is impossible to imagine rock music, although today this effect is used almost in all styles of contemporary music. Most people when they hear the phrase "guitar thing", imagine what the effect of the distortion/Overdrive or Overdrive. It can be considered the most popular selling of all the effects among aspiring rock guitarists. After all, kit and consists only of guitar gadgets distortion and combo amp. 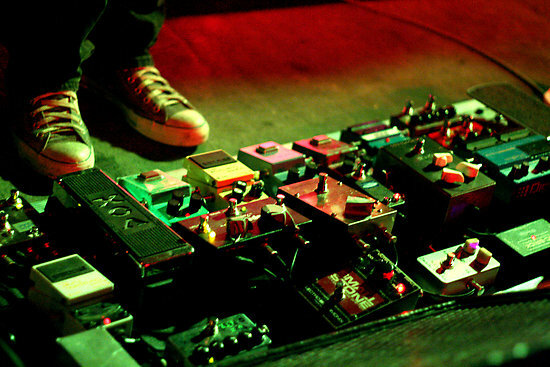 These pedals can be performed by a tube, transistor or digital technology. 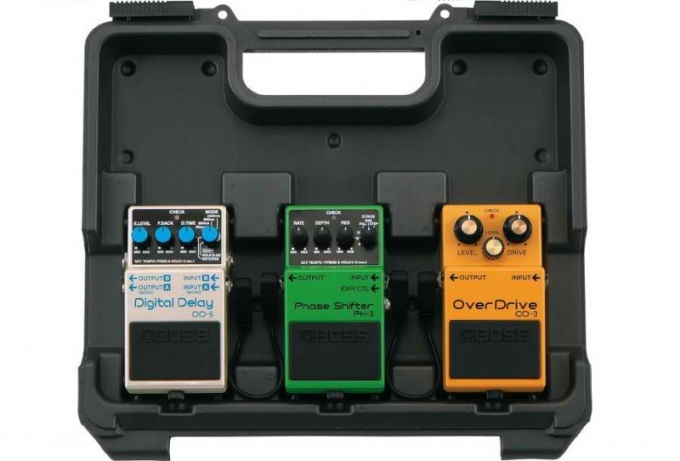 The difference between Overdrive and distortion that the Overdrive gives a much less distorted sound. Reverb just necessary for a professional musician, performing melodic party for a spectacular release, creating the impression of the game in the concert hall. Really get involved in this effect is not necessary, and that the audience will be heard porridge instead of ringing. The chorus effect gives the impression of dubbing tunes with several instruments simultaneously. Gives the tunes a special lightness and volume of the sound. Sense effect pedal delaya in the delay sound that allows you to get a fading repetition of the signal echo. Repeat time signal be easily adjusted by the rotary knobs. Flanger allows you to get a flying effect, even a jet sound. Similar in sound is the Phaser effect, but it has a more rich and soft sound. Very unusual and interesting distortion gives the effect of Wah-Wah. It is also called "wah" because of similarity of sound. It has a movable foot pedal and is used mainly when playing solo parties. During the performance, just need a compressor pedal. This tool aligns notes in the volume in the game. So there are no gaps signal or Vice versa no note stands out. Can be used on the rhythm, for example, in the Blues, and solo parties. Octaver creates the impression of the game at the same time two or three instruments, but in different octaves. Honestly, this pedal is rarely used. The equalizer allows you to add separate frequency and volume that you can turn on at a certain point in the game. You can, for example, be used to allocate a solo, including the pedal directly in the beginning of the party. The most popular manufacturers of lotions are considered to be company Boss, DOD, MXR, Dunlop. This brand is available almost in every music store. The cost of each of the pedal starts from$ 100, i.e.$ 500 you can build a decent chain of effects and sound is not worse than famous musicians.